Work in progress by Jill Arnold. 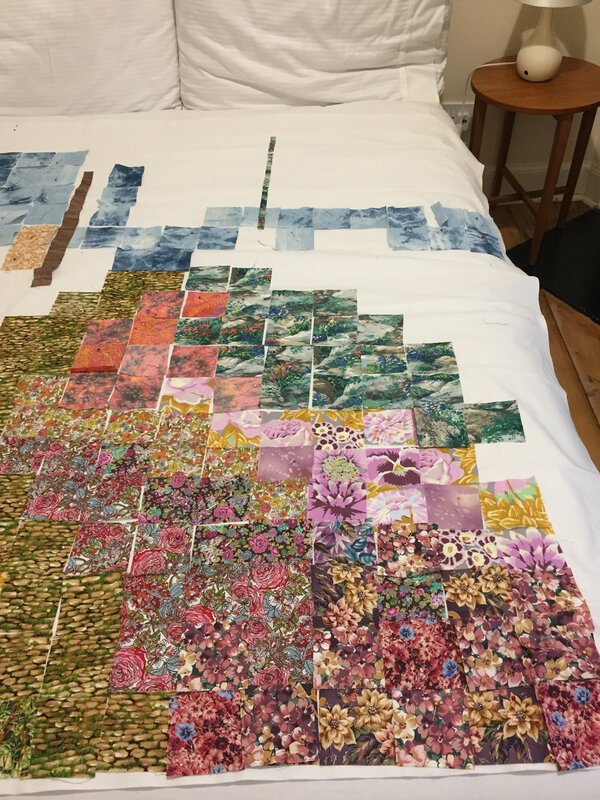 A view into a garden using patchwork techniques. The garden is made from squares which took me weeks to arrange to my satisfaction. When sewn together the squares are sewn so that horizontally the seams are not aligned but have a half square drop. I designed the gate using strips of black card. (I also went out with a tape measure and measured the actual dimensions of real garden gates.) The second photo shows the gate (for which I am using bias binding) pinned in position. It’s the start of another year and it feels like spring is already here! A sunny day always gets our artistic creativity flowing, taking inspiration from all around us in this stunning county. After a successful 2018 exhibiting year hosting many exhibitions across our region, we have decided as a group to work towards a new body of work to showcase to you all in our 2020 exhibition. Dates and times for this exhibition will follow shortly. We will keep you up to date with what we are all up to as individual artists and what is inspiring us on our groups Facebook page. Thank you for your keen interest and continued support in the Breckland Artists. Come along and see us this weekend at our local exhibition. Its free entry with lots of varied artwork on display, perfect for Xmas gifts! Open 10.00 am - 4.30 pm at Hingham’s Lincoln Social Centre NR9 4HW. Creative Medium: I paint almost entirely in acrylics, they are excellent for fine detail and there quick-drying properties are ideal for my way of working. Q1. What artist has influenced you the most? The artist who has inspired me most is probably Humphrey Ocean, although both David Hockney and Peter Blake are heroes of mine. Q2. What is it that inspires you most in Norfolk? 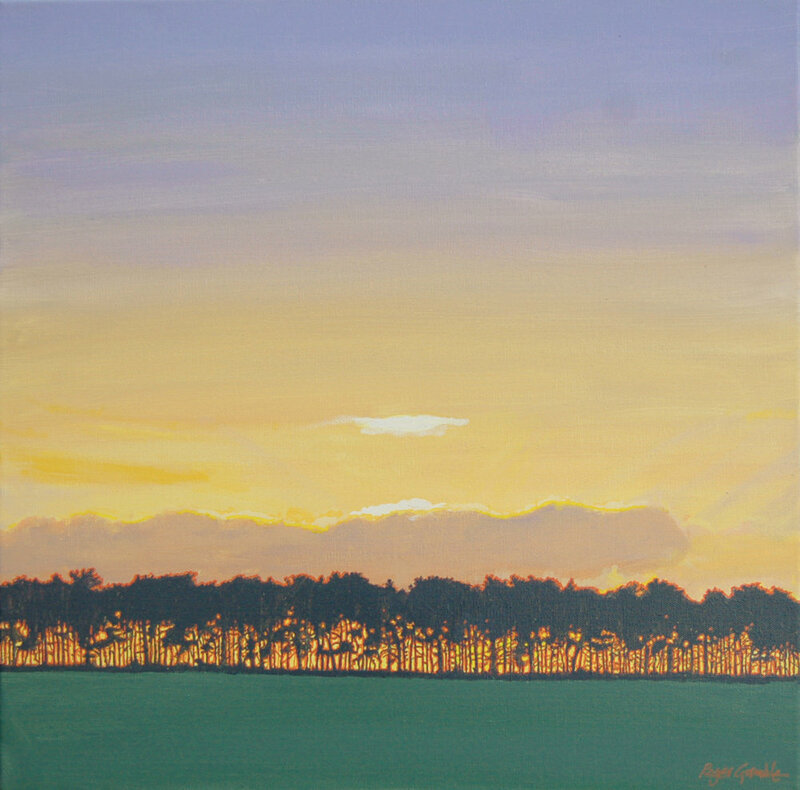 I am inspired by the Breckland landscape, it's rows of twisted pines and wide skies, and also by it's people, in commonplace situations. Q3. If you had to pick a favourite past artwork of yours what would it be? It's difficult to pinpoint just one work of mine as favourite, but if pressed it would be The Girl Downstairs, which won me a major prize and helped to kick-start my career. Q4. What are you working on at the movement? At the moment I am in a transitional phase, still evolving my deconstructed landscapes, but often returning to the depiction of People, going about their everyday lives, but presenting interesting possibilities. Creative Medium: Acrylic painting, drawing in charcoal, paint, pen and ink. Linoprints. Various construction materials occasionally. In youth I was influenced by Sickert. Many wonderful artists have impacted upon my work since: Jenny Saville, Willem de Koonig, Bernard Dunstan, Fred Cuming, Paula Rego, Chantal Joffe, Lucien Freud and many others. Some for their skill and insight, others for their freedom and imagination. My work is seldom topographical. It relates to contemporary human life. I have used Norwich City centre and market in my work. The Norwich Print Fair is always inspiring as are local artists such as John Kiki and Breuer Tidman. Also Fred Ingrams and Josey Brett. I am pleased with several past paintings, “In Yer Face”, “Knee Deep”, “Whatever” “Quantum Leap” &”Chairman”. “Cell Culture” is a construction comprising several drawings in mirrored cages. I am pleased with that. At present I'm continuing to try to produce work that is imaginative and arresting but within my compass. Q5. Can you choose 5 words that best describes your art? Figurative, textural, immediate, informal, accessible. Breckland Artists at Wymondham Exhibition. 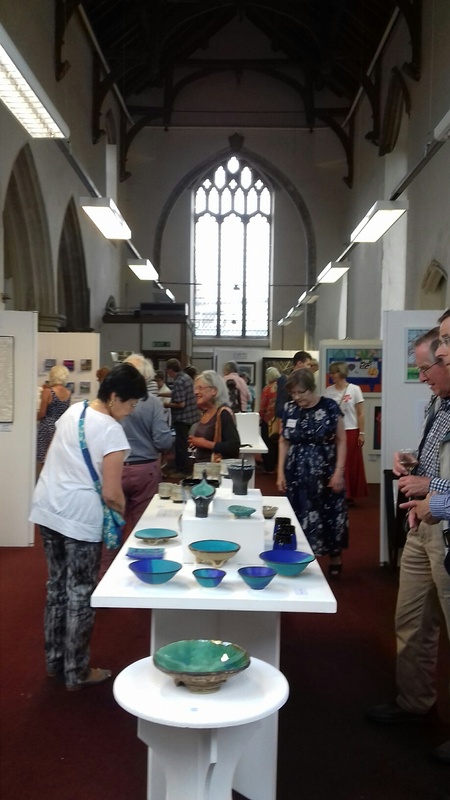 Thank you to everyone who attended our 'Meet the Artists' evening at the Wymondham Art Centre last night. It was great to see so many of you supporting us. The exhibition will run until this Sunday and is open daily. Visit the WAC website below for full details. Creative Medium: Painting in acrylic on canvas. I would have to say the Impressionists, and Turner. The sense of shifting light. My painting ‘ Gathering Light’ I think realised something of the inner landscape as much as the external. It’s something I always strive for. Something darker than my previous work. It's all about us Breckland Artists in Venue magazine! Lyn Aylward's self portrait features on the front cover of the latest edition of the arts magazine Venue. Along with a write up about us Breckland Artists. Breckland Artists in the arts magazine Venue. Getting ready for our Norwich Exhibition! 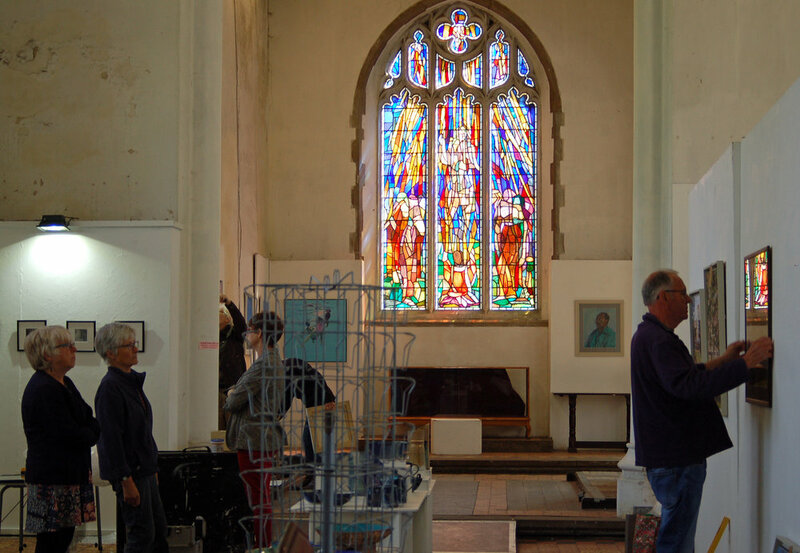 Us Breckland Artists have been busy today hanging all our artwork ready for the start of our exhibition tomorrow at St Margaret's Art Church in Norwich NR2 4TU. The Exhibition will run until Saturday 26th May 10.00am - 4.00pm. Please come and have a look at the variety of our artwork on display. 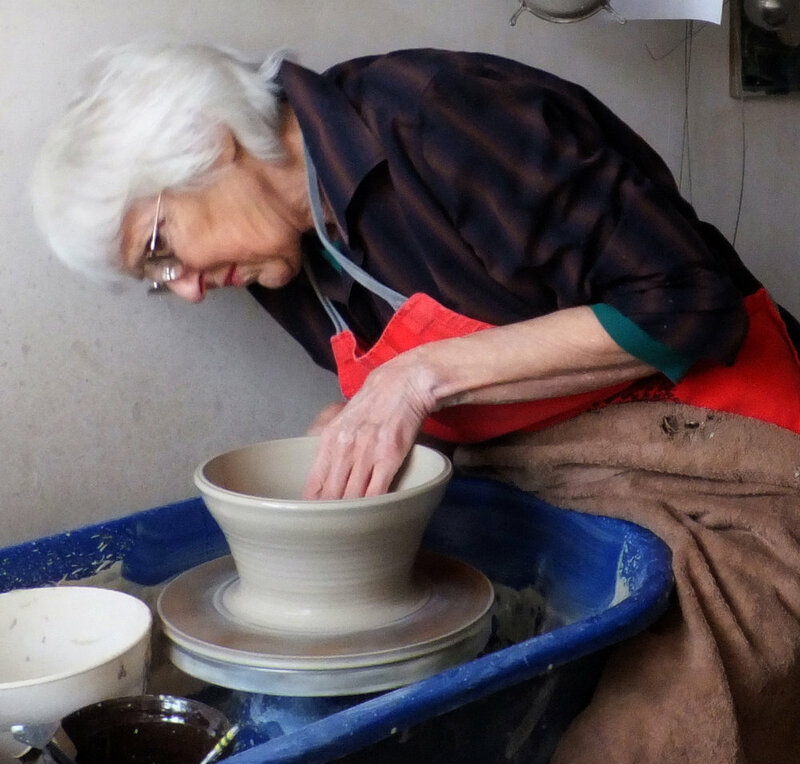 Much of my inspiration comes from the clay itself and the magic that happens in the heat of the kiln but I am always on the lookout for natural things like leaves, seeds and shells that can be pressed into the clay to create textures. Ideas for one off pieces often originate when I am out walking in Breckland with my dog, not necessarily inspired by the landscape but the peace and solitude free up my mind to explore new directions. There is one piece that I made many years ago that I would not part with. I was commissioned to make a jug based on the 14th century Grimston ware. It had a face on the rim and I was lucky enough to be lent an original fragment to copy. After the commission had been filled I made another one for myself which turned out to be much better than the first one. It was glazed with a lovely apple ash glaze that I had just developed and everything worked just as I had hoped – a rare occurrence! I have been invited to take part in a sculpture trail at Hoveton Hall in the summer so I am planning work for the garden. At the moment I have a few bird baths going through the Kilns and other garden/conservatory ideas are incubating. I am sure that I will revisit the Green Man if I have the time. Useful, colourful, traditional, durable, domestic. Breckland Artists Latest Member Jayne Stinton. We are delighted to introduce you to the latest addition to the group, Jayne Stinton. "I am a visual artist (and sometimes jewellery-maker) and work from my studio at home in Garboldisham on the Norfolk/Suffolk border. 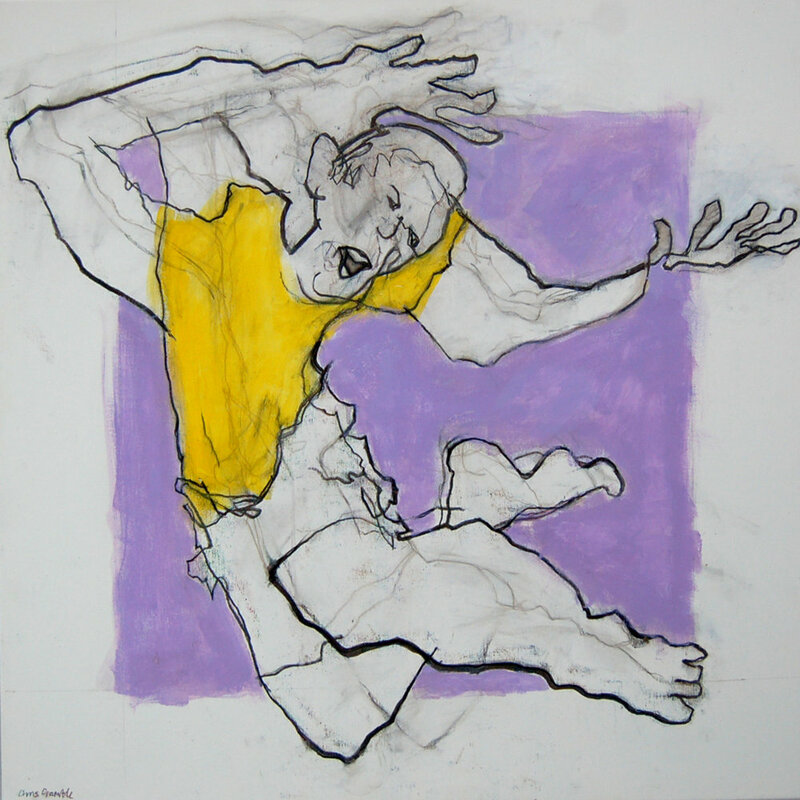 Although I occasionally dip into portrait and other figurative work, I am principally a mixed-media artist pursuing abstract and semi-abstract explorations of atmosphere, feeling and visual imagery through line, form and texture using drawing and mixed-media." 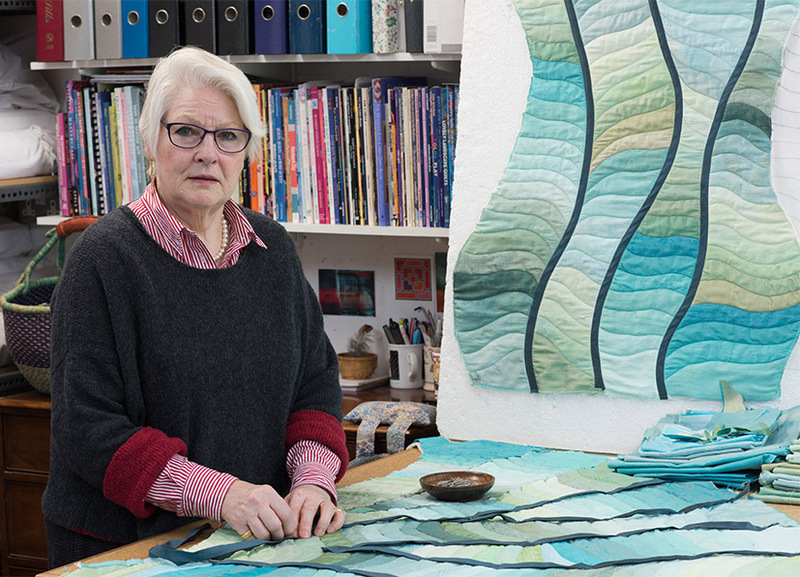 Jill Sharpe is are next Featured Artist who specialises in stitched textiles. Q1. Which artist has influenced you the most? It would be hard to pick one particular artist but the work of Gerhard Richter by its very diversity has to be one. For colour I consider Matisse and Hockney influential and in the field of textiles Sara Impey and Pauline Burbidge are favourites. I love the seasonal changes and watching the crops developing. The landscape in itself does not inspire me having more affinity with northern moorlands but I love observing the sea in all its different moods. A piece called Entwined made in 2011. It is hand sewn in silk using paper templates and hand quilted. The design plays with multiple symmetries and the interplay of shades of colour. I have been producing a series of pieces using the titles of tracks from Bob Dylan’s album Blood on the Tracks. I have completed Shelter from the Storm, Tangled up in Blue and Meet Me in the Morning and am working on Idiot Wind at the moment. Texture, Flow, Movement, Colour and Line. This new post lets you get to know a little bit more about us all as individual artists. 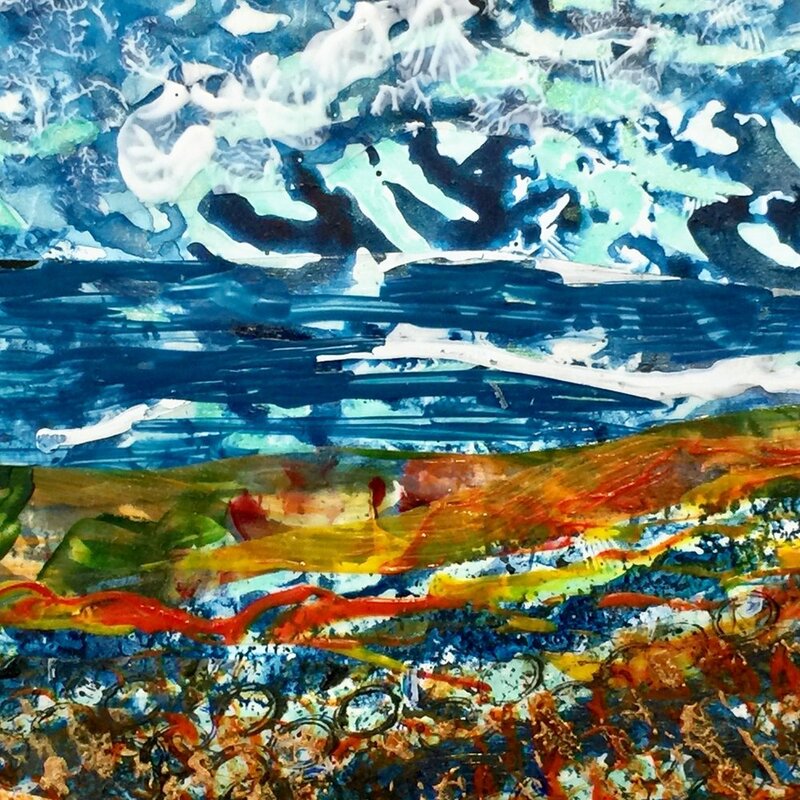 We start the New year off with Emma Wells who specialises in encaustic wax art and mixed media painting. I couldn’t pin point it down to a particular artist but I love the mark-making, composition and freedom of Chinese Brush Painting, from the old calligraphy scrolls to the thrown ink style of flora and fauna. I always try to add an element of this into my own artwork. There is so much inspiration in Norfolk for artists but what inspires me the most would be tall sedge grass blowing in the wind, dramatic stormy skies and the mud flats at low tide. A mixed media on paper piece called 'Fenland'. This is a personal favourite of mine as it is extremely atmospheric and captures the eerie gloom of the fens just as the rain and darkness falls. Currently I am working on an encaustic wax collection of British garden birds inspired by the many colourful winged visitors to my own garden. Emma Wells creating encaustic wax art in her studio. 'The Nuthatch' Encaustic wax on card. Part of a collection by Emma of British Garden Birds. This year of 2018, we are holding 4 exhibitions, all details in our diary all at different venues, starting in Norwich, then onto Wymondham, and the next a big adventure for us as we are going to Thornham on the North Coast of Norfolk and finishing the year at the Lincoln Hall in Hingham. Invitations will be sent closer to the time, and we do hope that you can make one of the venues if not all of them. We are pleased to announce the dates for our annual Summer Exhibition; this year to be held in the Undercroft, Norwich. We look forward to sharing a fantastic variety of work this year with a debut from our newest member, Anna Loake. Watch this space for details of our exciting opening event! We are pleased to announce that four of the Breckland Artists are presenting an art trail as part of the Norfolk & Norwich Open Studios event. Details of this event and all the Breckland Artists that are taking part in NNOS this year can be found in the brochure at the link below. With our growing band of merry men...and women, we once again look forward to visiting Wymondham Arts Centre with an air of excitement to show our latest works. Having attracted new member Emma Wells to join us, this will be her first showing with Breckland Artists. This year will see twelve of us showing and we invite you to a Private View on Tuesday November 1st. at 6 - 8pm.